The Galerie de Sèvres in Paris will be showcasing Philippe Apeloig’s work. Ceramics gave this graphic-poster designer an outlet for formal expression and intense emotion through three techniques and five formats. 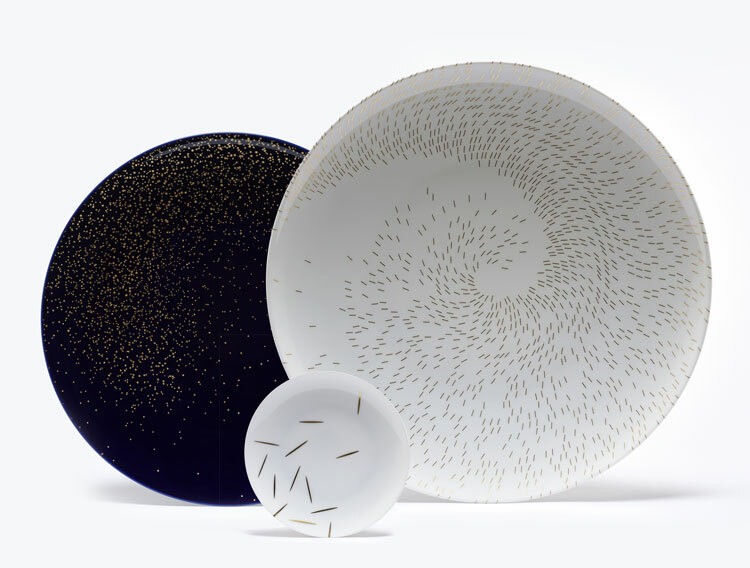 His creations take shape on forms from the repertoire of the Cité de la Céramique: the Adrien Rovero tray or the plates from the Diane dinnerware. From May 2 – the exhibit opened during the D’Days festival – , Philippe Apeloig will be exhibiting the three motifs “Galaxie,” “Tourbillon,” and “Paille,” skillfully created by the artisans at the Manufacture de Sèvres. “The punctuation marks create a threaded effect; the accumulation, repetition, and superimposition of the effects of the dashes and dots form movements in space like constellations, waves, or particles that form an interstellar puzzle,” explains the graphic designer during a final review with his close collaborators and the technical teams at the Manufacture de Sèvres. Applied in gold on white porcelain or the blue background of Sèvres, the characters impart vibration and radiance to the collection, using both glossy and matt finishes. The richness of the technique creates depth and a sense of movement. Valérie Jonca, Director of the Design and Production Department at the Manufacture de Sèvres and its workshops, is in charge of antiques and contemporary projects. In fact, the Manufacture de Sèvres both reissues older works and creates new ones. In Jonca’s words, “we called on Philippe Apeloig for new creations due to his talents as a graphic designer, as well as our mission to conserve skills and expertise. We hold a huge collection of graphic design works from the second half of the 19th century and which has expanded over the time through today, but we have very few contemporary works. We needed to update our collection, to enrich it, and to bring the trades to life in our workshops, especially engraving, since engraved motifs are essentially retro now. We asked Philippe Apeloig to work on several projects that would allow him to use various engraving techniques to bring life to our collections.” The first, ‘Tourbillon,’ extremely graphic, uses a photosensitive printing technique and aligns perfectly with the project. ‘Galaxie’ uses more material and involves chisel engraving, a technique that made it possible to use large amounts of gold to provide depth and to enrich the decor. The technique for ‘Paille,’ the third project, is somewhere between the first two. It generated a healthy competition since it pulled on all the printing workshops at the Manufacture de Sèvres.” Exhibited in Paris at the Galerie de Sèvres until the 29th of July, Philippe Apeloig’s works are paired with his print designs on paper by the Japanese brand Awagami. The exhibit “Apeloig T’s” on view at Tokyo’s Ginza Graphic Gallery from August 7-September 16 provides a glimpse into the graphic designer’s unique relationship with Japanese culture. The Galerie de Sèvres in Paris will be showcasing Philippe Apeloig’s work. Ceramics gave this graphic-poster designer an outlet for formal expression and intense emotion through three techniques and five formats.